We're approaching the end of the month with naught a review in site! Until now! This review starts a boon of reviews for October for SuperPhillip Central. We start off with the action-packed glitz and glamour of Azure Striker Gunvolt 2, a game that outdoes its predecessor quite admirably! See how with the SuperPhillip Central review. Second verse, notably different from the first. Between Azure Striker Gunvolt, Mighty No. 9, and 20XX, there are no shortage of titles competing to take the run, gun, action-platforming throne that Capcom's Mega Man has since abandoned. While the original Azure Striker Gunvolt was a fun romp and a nice attempt from developer Inti Creates at creating a successor to Mega Man, their second go at things, Azure Striker Gunvolt 2 is in a league of its own. 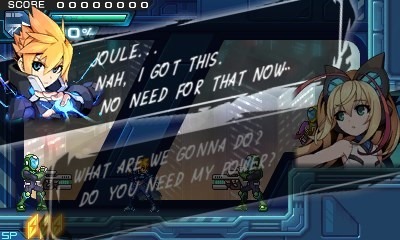 One of the big draws of Azure Striker Gunvolt 2 is the ability to play as not just one but two characters. After proceeding through the opening stages, you have the choice of choosing to play the campaign as either Gunvolt or his rival from the original game as well as this one, the Adept-hating-and-hunting human Copen. The levels you play as each character are almost totally unique from one another, and each also has their own plot, select-able order of boss stages to play and beat, experience levels to earn, skills to use, and their own set of challenges. As a side note, challenges are much more desirable this time around. One major reason is that you aren't forced to choose a challenge to attempt, and you're not limited to picking just three at a time. Rather, after you beat a level, you can attempt as many challenges at once as you like, making for a much faster means of finishing off challenges and earning rewards such as materials to make new equip-able items and money. The percentage of challenges completed for each character also affects what ending you get. 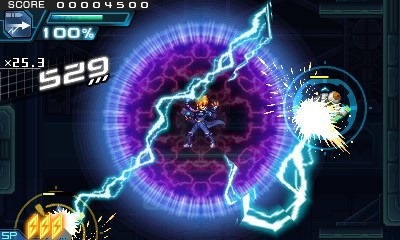 Challenges range from getting a certain rank on a level through proficient play to level-specific goals such as beating a mid-boss in a specific time frame or breaking all of the windows in the cathedral stage as Gunvolt. Back to Gunvolt and Copen, these two protagonists aren't just two sides of a different campaign. They thankfully also play incredibly differently from one another. 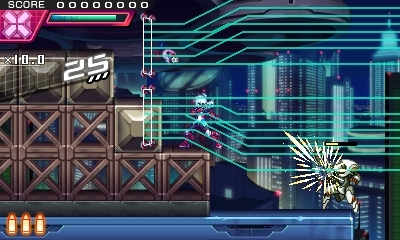 Gunvolt uses his bullets to tag enemies, and instead of those being the main means to eliminate enemies like in a game like Mega Man, when Gunvolt pulls up an electrified Flashfield around him, all tagged enemies take damage. Of course, you can't just spam the Flashfield all you want. It takes up energy, and if you use it too much, Gunvolt overheats, making his susceptible to enemy attacks. Energy can be restored either over time, or through double tapping the down direction on the D-Pad. The more you tag a foe, the greater the damage to that enemy from GV's Flashfield. Meanwhile, Copen uses a more athletic means of attacking. Through air dashing into foes, he tags targets, allowing him to fire and destroy enemies with ease. It's really fun to dash from foe to foe, destroying each without touching the ground in order to gain more points. 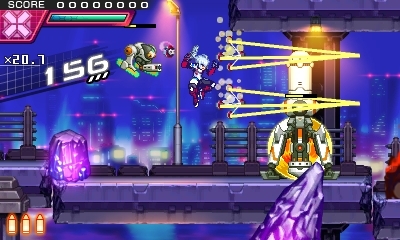 Of course, like Gunvolt, there's a limit to how much Copen can use his signature ability, and that's denoted by the orange bullets on the bottom left corner of the main screen. When Copen takes damage, a bullet goes away. If he's damaged without any bullets filled, then his health gauge lowers from actual damage. With Copen, you dash into a foe (no, not like Mighty No. 9), and then unleash your furor onto them. Copen is more like Mega Man than Gunvolt is, and I don't mean by how he attacks. You see, after defeating one of the game's seven main bosses, Copen takes that boss's special attack to be used whenever he likes. Unlike Mega Man, however, each weapon doesn't have its own gauge of how many times you can use it. Instead, they all use one main gauge that refills rather quickly when a weapon isn't used. Defeat a boss as Copen to earn his or her specialty weapon. Hmm. That sounds a bit familiar. Another piece of the game that is exclusive to Copen is the use of chips. When equipped, different chips provide different benefits to Copen, such as more bullets to work with, quicker energy recovery, and more. Each chip takes up a certain amount of memory in Copen's repertoire, and since he has a limited amount of storage available to him, you can't gung-ho with equipping chips. Overloading Copen's available memory will unleash adverse effects in-game to him, some rather devastating. Fortunately, hidden in many levels are memory upgrades that add memory to Copen. Not only are these helpful, but they're fun to find. The actual levels are more intricately designed compared to the original game. There is a wide array of horizontal sections as well as verticality to consider. Levels meander all over the place, and exploration isn't just some frivolous option this time around either. This time it's encouraged not just by getting medals for bonus opportunities after the completion of a level, but certain challenges ask of you to find all five medals in a given level. Some of these are hidden really well, forcing you to leave no stone un-turned, or in this case, area unexplored. One of Copen's exclusive levels, this highway, is one of my favorites in Azure Striker Gunvolt 2. At the conclusion of each level stands a formidable opponent for either Gunvolt or Copen to engage. Boss battles rely on the quick noting of patterns, competent evasion of attacks, knowing when to provide offense and when to get the hell out of the way from an attack, and finding the best means to empty a boss's health gauge, which is divided into three parts. As each part is emptied, the boss gains new attacks, and when two-thirds is removed, the boss unleashes its special attack. These special attacks usually take up a lot of real estate on the screen and the first time facing the boss can seem a bit unfair, as you really have to know what to expect to avoid the attack. Thankfully, one-hit kill moves are foreign to Azure Striker Gunvolt 2, so the worst you can expect is a reasonable chunk of health removed from your character's gauge. Azure Striker Gunvolt 2's individual campaigns are a tad shorter than Gunvolt's campaign in the original game. However, playing both campaigns together, leveling up each character, and finishing off a majority of the challenges for both characters adds a greater duration of play time overall. You can beat campaigns fully in less than ten hours, but there is a lot of replay value that comes afterward in boss rushes, secret levels, and leaderboards. 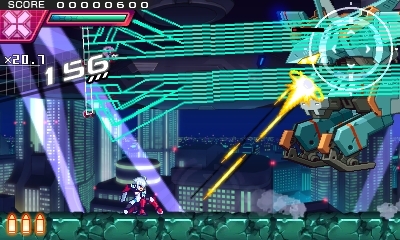 Like Azure Striker Gunvolt, the game's sequel possesses a gorgeous 2D art style that looks absolutely beautiful. The spritework is immensely detailed and well done, and the backgrounds are pure eye candy. Effects like explosions and such are also quite engaging to the eye. That said, the UI does have some issues, particularly with the dialogue. Text boxes take up a significant portion of the screen's real estate, sometimes even covering up dangers like enemies and bosses (it covers a portion of the left side of the screen as well as the bottom, albeit transparent). I never died because a text box was in the way, but it is something to consider while playing. Upon repeated play-throughs of levels, there is a nice quality of life implementation where you can completely turn off conversations, meaning you'll seldom be stopped for scenes containing dialogue. This makes replays of levels much less taxing than they were in the original Azure Striker Gunvolt. If you don't care for anime melodrama, you might want to just skip through story sequences like these. 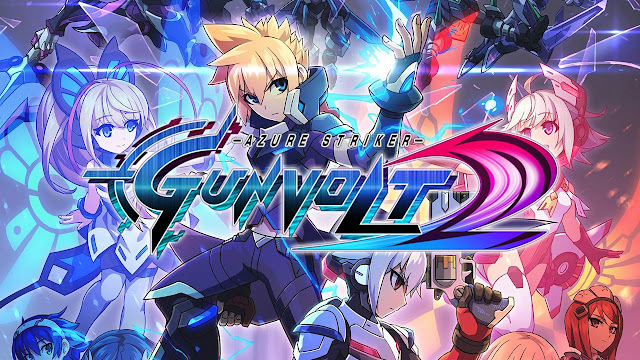 Azure Striker Gunvolt 2 is indeed what I would call the heir to the Mega Man throne. Where games like Mighty No. 9 failed, Azure Striker Gunvolt 2 excels with blistering fast and satisfying gameplay with two unique play styles, challenges that encourage multiple play-throughs of levels, and regarding these levels, speaking of which, levels that can be played leisurely or briskly in pace that are fun to play repeatedly, and a story that is engaging from start to finish. Although Capcom currently has Azure Striker Gunvolt 2's inspiration on indefinite hiatus, Gunvolt and Copen are more than competent enough to take the Blue Bomber's place.